For The Molly Bear Foundation, Inc. Team Molly Bear is a group of regular people who join together through triathlon and road races to raise funds and awareness for the Molly Bear Foundation. What started with 5 people in 2007 was more than 30 in 2009. You don’t have to be a super-star; all we ask is that you believe in the cause and bring your enthusiasm. If you have never done a triathlon before, or you think running a 5k would be a great way to get in shape, join the team. You’ll immediately get the support of a team of dedicated individuals, and the inspiration of the toughest little girl any of us know: Molly Bear herself. If you’re interested in joining the team, we would love to have you. Please email team@mollybear.org. 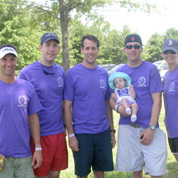 2009,our first year with Team Molly Bear supporting the Molly Bear Foundation was a rousing success. In six events we were represented by 30 athletes who, together, raised over $13,000 from more than 150 individuals. In 2010 we saw many athletes return, and welcomed a number of new faces to TMB. • Fred Galik going all the way to Hilton Head, SC to race his first triathlon! Many thanks to all of you who participated in a race; volunteered at an event; or supported an athlete in 2010! Join Team Molly Bear as we support this worthy cause.